Ten years ago, the murders of several young women whose bodies were dumped into the canal rocked Dublin. Student Will Hurley was convicted of the murders after confessing, and has been locked in a psychiatric hospital ever since. 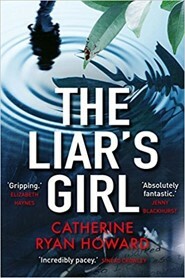 When the body of another young woman is fished out of the Grand Canal, while Will is still incarcerated, questions are asked. Does the notorious Canal Killer have a copy-cat? Or is it possible that Will is innocent? Will insists he has more information on the latest killing, but the only person he will talk to is Alison Smith – his girlfriend at the time of his conviction. Alison fled to the Netherlands after Will’s conviction, trying to put her shattered life back together. Obliged to return to Dublin, Alison has to face the man she’s spent the last decade trying to forget. Largely told from Alison’s point of view, the story flits back between her story of moving to Dublin for University, settling into student life and meeting Will; and the Alison in the present day, having to re-open old wounds when the police bring her back to Dublin to talk to Will. There are also a few scenes in the present, taken from the point of view of the killer, without actually revealing the killer’s identity, which are unsettlingly disturbing. Enough doubt is cast early on for the reader to question Will’s guilt, and the puzzle of the most recent murder happening while he is incarcerated is an enigma for the reader eager to solve. Did Will have an accomplice who has decided to start killing again? Has Will known who the killer was all along? Or is Will completely innocent, locked up for crimes he did not commit? The only way to learn the truth is to keep on reading to the end, and for this reason this book becomes impossible to put down. A psychological thriller should have an emotionally damaged main character, and we have this in Alison, who has never really managed to escape her past no matter how far away she has tried to run from it. The climax reveals a devastating twist that I genuinely did not see coming. This utterly compelling novel will appeal to fans of psychological thrillers, and it’s one to read when you’ve got several hours of peace and quiet for reading time, because once you pick it up you will not want to put it down.